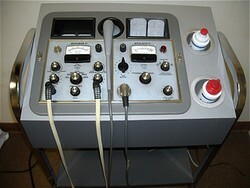 In a chiropractic setting electrical muscle stimulation is generally used prior to an adjustmet. It relaxes contracted muscle tissue and in doing so prepares the treated region for the manipulation. Better movement is usually achieved in an area of normal muscle tone compared to one that is in spasm.